When you walk into a Las Vegas sportsbook, you’ll notice a giant black board with bright shiny lights with a bunch of numbers and team names. Not sure how to comprehend what is written on those boards? I’ll help you out. To th left of every team or athlete on the betting board is a number. That number is used for reference purposes. After you have decided what team you want to wager on, you’ll provide that number to the (hopefully) friendly teller. That’s the only relevancy of that number. Typical Las Vegas Sportsbook with lines on the board. The real numbers that matter are to the right of the team name on the betting board. You will see either a point spread or moneyline. The point spread is when you wager on a team to win by a certain amount or to not lose by any more than a certain amount. If there is a + symbol in front of the number, that means the team is the underdog. If it’s a – symbol, they are the favorites. So let’s say you see Dallas –5.5. That means the Cowboys are a 5.5 point favorite and if you wager on them they must win by at least 6 points or you lose the bet. If Dallas was listed at +5.5, they can’t lose by any more than 5 points or you lose right along with them. When betting the moneyline, you’re picking a team to win straight up. Point spread doesn’t matter. They either win the game outright or you lose the bet. The moneyline is based on how much you have to bet in order to win a certain amount. If the line is –160, you have to wager $160 in order to win $100. If the line is +160, you would win $160 on a $100 bet. So obviously when a team is an underdog, if you wager on them and they win it pays out more. 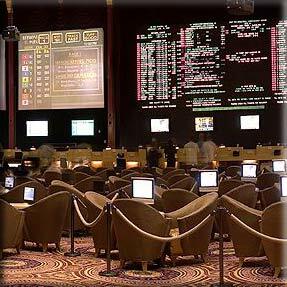 Most people have no idea how Las Vegas sports betting lines are set. They assume some dude knows everything there is to know about sports and sets the lines based on how he thinks the outcome of the game will go. That couldn’t be any further from the truth. The point spread actually has no bearing on how many points handicappers expect a team to win by. It’s based on what they think will entice action on both the favorite and underdog equally. Las Vegas sportsbooks don’t care who wins the game. They want an equal amount wagered on the favorite and underdog. Why? Because with the juice factored in, they can’t lose. If you wager $1,000 on the favorite and your buddy wagers $1,000 on the underdog, only one of you will win. But Vegas is guaranteed to win regardless of the outcome of the game between the two of you. The lines are initially set by a handicapper based on how he feels will entice action on both sides. As the time leading up to the game progresses, the lines fluctuate based on how the public is wagering. If there is too much action on the favorite, for example, the point spread will rise.